KONO District has become the hub of arts and culture in the Bay Area, featuring the Oakland First Fridays Street Festival and Art Murmur Gallery Walk, which draws between 30,000 and 50,000 attendees each month. Oakland has the second highest per capita of artists in the country and KONO houses 20+ art venues, several murals and public art displays. Along with the arts, KONO features Oakland’s most popular craft beer gardens and pubs. Visit KONO to see what all the Oakland hype is about. KONO includes an important Korean-American commercial center, a creative arts community, Sutter Health Alta Bates-Summit Medical Center and other healthcare services, new residential projects and a variety of multi-ethnic restaurants, shops and services. Oakland First Fridays is Oakland's monthly street festival, taking place every first Friday of the month on Telegraph Avenue from West Grand to 27th Street. The project attracts approximately 330,000 annual visitors who come from the greater Bay Area and beyond to enjoy performances by local artists and shop from community businesses. Oakland First Fridays has been recognized as a premier Bay Area event by many media organizations, including the San Francisco Magazine and Alaska Airlines. Oakland First Fridays is a large part of KONO’s marketing program, which is geared towards driving traffic to the neighborhood businesses. The economic boost both revitalizes the economy and effectively attracts more visitors. This has proven to be true by the statistical evidence we gather through our economic impact reports. KONO received a grant from the Flieshhacker Foundation to place mosaic art on the litter containers in the district. 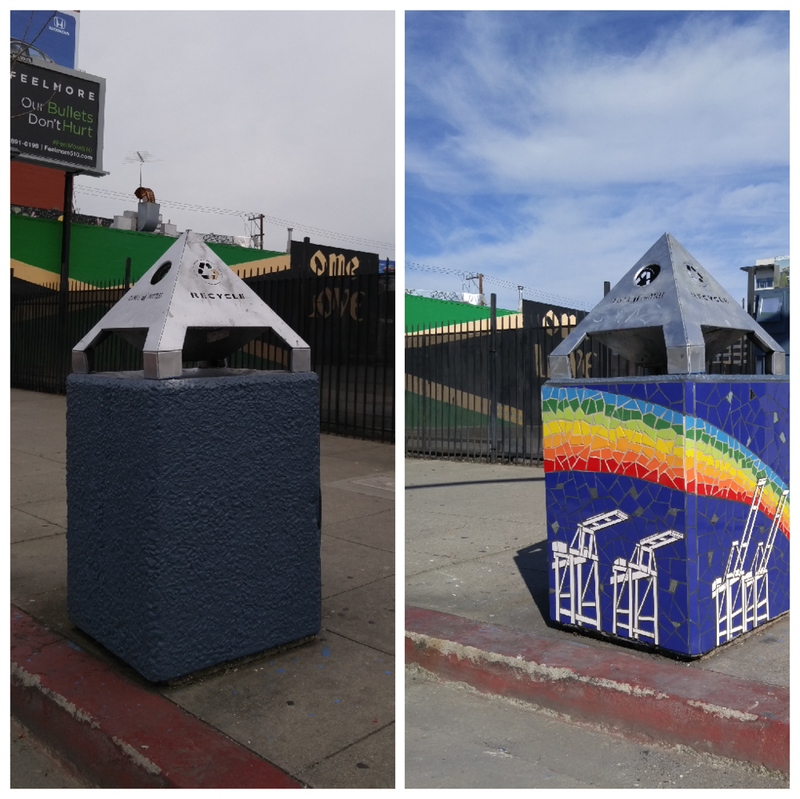 Mosaics on the trash cans are a great way to beautify the district and the project has been a success in local areas such as Temescal, Montclair, and Old Oakland. Artist, Juan Lopez, has completed 5 litter containers. This local artist has been working with tile for 25 years and is invested in community transformation especially with his work on trashcans. He often creates the mosaics with a nature scene and wildlife which is refreshing in a concrete, urban environment and symbolizes an evolving neighborhood. As he says, “I’m turning a trashcan, which is normally an eyesore into something beautiful for everyone…I’m transforming trash into treasure.” Beautifying the trashcans elevates the artistic presence of the neighborhood and fosters pride in the district. They are representative of KONO’s renaissance and emergence of the arts, culture and environmental consciousness. KONO recently received a $5,000 grant from Flieshhacker Foundation to create more mosaic cans in the neighborhood. Contact us if you would like to sponsor a mosaic art can (510) 343-5439. See interviews with the artists and work in progress, in this video produced by Laney College Digital Media Club. Go on a self-guided tour of the Art Boxes with our neighborhood map. A big thanks to all the artists: Fulani Carter, Eddie Colla, Jack Eastgate, Stevan Guiterrez, Lisa Hoffman, Dave Young Kim & Stephanie Leung, Joanne Ludwig, Pancho Peskador, David Polka,Lynne-Rachel Altman, Momoko Sudo, Ashia Tymous, and Desi Wome. KONO has recently invited some of the artists back to refresh the art. In addition to the 83 trees KONO planted in 2013, the Sierra Club planted 12 new Brandywine maple trees on 25th Street on Saturday, making an immediate difference in the look and feel of the block. They intend to plant more trees along the south side of the block in the fall. 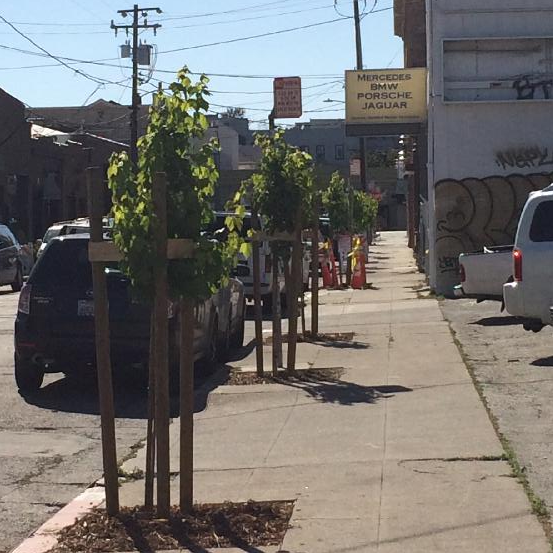 They also planted 4 new trees on 29th St. These trees were paid for by a grant from CAL FIRE. KONO was able to connect Sierra Club with volunteers from Embrace Church to help with the planting. Taking KONO to the Next Level of Cleanliness and Care! 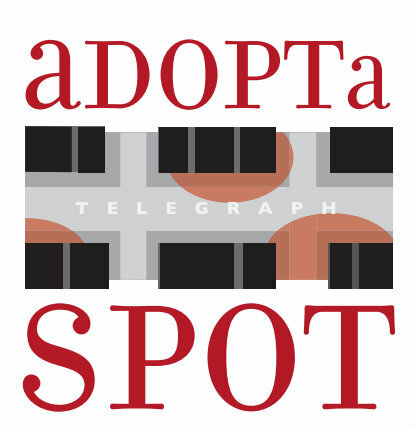 We will give you a flyer with your name or your business name on it proclaiming your participation in the AdoptaSpot Program. You can post it in your window to show off your pride in taking care of the neighborhood. KONO would like to offer a HUGE thank you to Phat Matz BBQ for stepping up and Adopting their Spot at 3415 Telegraph Ave.
To register and get your supplies today contact Shari Godinez at (510) 343-5439 or shari@koreatownnorthgate.org .